I took 7 days off the bike after the race to refresh the body both mentally and physically. I put in only 5.5 easy hours on the CX'er and SS this week. The past two days showed signs of winter with snow and wind chills in the teens today. Good winter clothing makes those rides very doable. Fenders help tremendously also. Time for some exlporation next week. I read in the paper Hamburg has 28 miles of gravel roads. Mmmm, gravel. Hamburg is a quick 6ish mile ride from home. If I find some good raods I can likely link them up to Pinckney and maybe the Lakelands trail to make a good loop. I usually venture East and sometimes North to Fenton, but this year that will change. A few more weeks of school then almost a month off to ride! Embedded links won't work, so you'll have to click the hyperlinks. Well, its over. A long season just ended yesterday and I am very happy with it. I topped the season off with an 18th place out of 53 Pro finishers. I crossed the line in 1:40:12, 15 minutes faster than last year!!! Improvements. 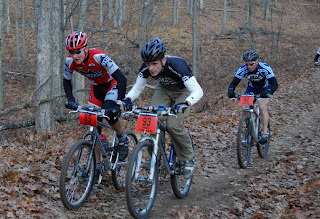 Pre-rode the first 7 miles of the trail on Saturday before heading to the expo for packet pick-up. After a nice pasta dinner at the Brew Pub, it was a relaxing night in the hotel room. Saturday morning came with temps in the mid 20's. I was out watching the fam start the race. Then a quick drive and hike over to Williamsburg Rd to watch them come through while endulging in some cold blueberry pancakes. Another short drive got us to the finish line, but late for my mom coming accross the line in 2:40. Switched vehicles and drove down to Kalkaska. Had to miss my dad and uncle finishing; they came in at a quick 2:16 and +:30. Ay Kaskie, it was prep and warm-up. The first few miles of the trail provided some excitement for fast trails. After a long wait with call-ups, we were off. Started about 3/4 back and picked people off left and right. Following moves, we dwindled the group down. For the most part, it was Randy, me, jeans man from Ohio, Dan Jansen, and Christian Tanguy. 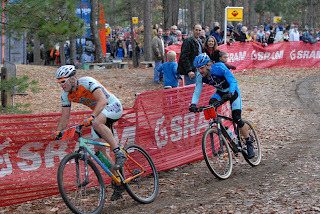 We were moving along pretty good riding in 11-15 place. Just past Williamsburg Rd, the jeans man cut infront of me and rubbed wheels. I tried to keep it straight, but ended up flying into the woods. A branchy bush stopped me, but after re-mounting, I was a long shot from the group. I was out in no mans land trying to find a groove. I kept looking back waiting for someone to catch me. Finally with 7 to go, a guy from PA and Joe Brzuchanski caught me. Yes! We rode together almost the rest of the way. With 2 miles to go, I had to get off on a climb to pull a stick out of my derailluer. I couldn't shift the stick out, so I had to get off on a climb. They pulled away, but I was trying to get back. I bridged the gap up to Joe just before the last hill coming into Timber Ridge. With all the people cheering, I stood up and tried to gap Joe. He hung on at the beginning, but as I went up people were yelling at me to go and I was gapping him. Just as I am sitting down, the trail goes left and I look up to see more of the hill. Crap. I jump out of the saddle and finish it off. Was able to ride to the finish 5 seconds ahead of a fast Joe and 5 seconds behind the PA guy. I was very happy with the result. The group I was with ended up passing Ross Schnell and placing 10-15. They were 1:37:30. Very fast race and awesome competition. Great way to end the season. Photos from my so-pro photog should be up later in the week. 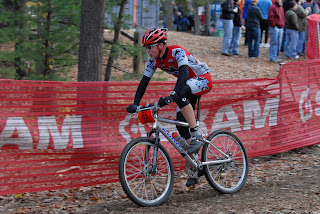 Mike from Mashers Media has been filming the MTB and CX races this season. 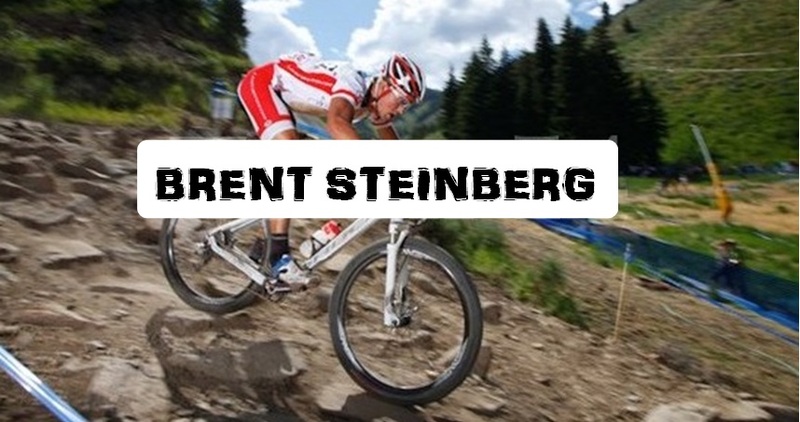 He's got some sweet videos out from many races. CLICK HERE to see the video from last weekend. I've even got a nice little bunny hopping action going on in it. Mashers Media is also doing the Iceman Cometh video this year. It should rock and put the old Iceman vids to death. Sound like racing action, helmet cam on seatpost action, and even still shots thrown in. Today turned into another awesome weather day. 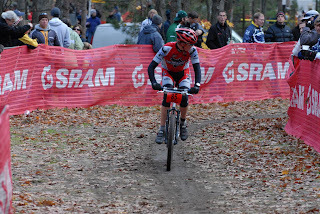 CX season is supposed to be cold, dreary, muddy, and even snowy. 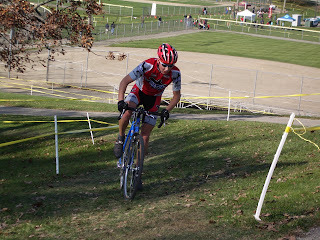 Out of my CX races this year I had 60's, 70's and 80's all on sunny days. I can't complain about that. We lined up with 23 strong in the A race. The field was stacked with the usual suspects, MTBers getting the final touches in for ICEMAN and even some out of town guys came in. I started the first lap in my usual spot. Robert and I were fighting it out for dead last. 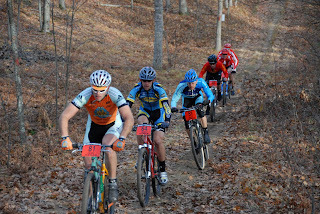 Just before the end of lap 1 I got into my rhythm while everyone else settled down from the fast start. I rode my bike and enjoyed every moment of it. Every lap I would pass people. 1, 2, or 3 people a lap. Just like my other races, my steadiness won. No crashes, no screw ups, and 110%. 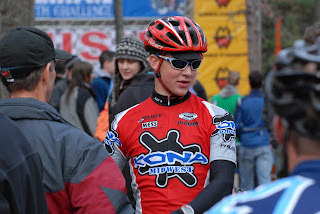 After 3 very tough end laps battling it out with a WMCR rider, I came in 11th overall and am very happy about my result. 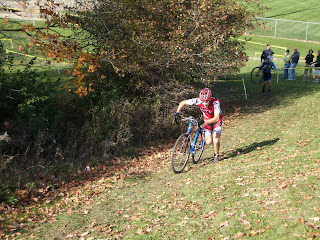 Props to the WMCR rider who could run like the wind on the run-up. I would gap him, then he would run-up and catch me. Finally on the last lap he got me. 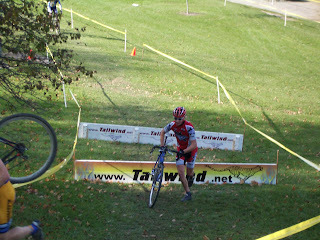 The funniest part of the race was after the first set of barriers on one of the middle laps. I had ran over the barriers (smoothly) and jumped back onto the saddle. I look up and hear, "Awe, man, that has got to hurt." It was a 14-15ish year old kid standing at the end of the tape over his BMX bike he had just rode there. That gave me a great mid-race chuckle. Looking foreward to next weekend shows some 40 degree weather and hopefully no rain. Today was probably the hardest I have ever raced in my 3 years of racing. After the race my lungs were on fire like I had just had an asthma attack. Talk about 1 hr of VO2 Max. My form is good and with a little rest and a touch of intensity between now and Saturday, I should be good to go. Not to win, but have a good race, have fun, and try to place well. Check this video out. It's a spoof on Mythbusters with 26" vs. 29". That's all I will say about that subject. Well, except for I'll put my money on a 29er winning Iceman. 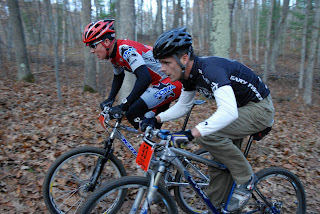 CX tomorrow at Vets Park. Ready to race!